Loewe extends its 4K range with new Reference Ultra HD TV line-up | What Hi-Fi? Reference 4K model includes Bluetooth streaming, 1TB hard drive, Dolby/DTS decoding and integrated 120W, eight-speaker soundbar system. This is the new Reference series 4K TV from German manufacturer Loewe, and it's packed with high-tech features. Inside the minimalist design is an eight-speaker, 120W sound system, a 1TB hard drive for pausing, recording and archiving content, Bluetooth and DLNA connectivity as well as a Dolby/DTS decoder. There's an iOS/Android smartphone app for remote recording to the hard drive, and a 'second screen' tablet app for viewing content from the TV on your portable device. The on-screen user interface has a customisable homepage and you can buy the TV in aluminium black, aluminium silver, high-gloss white or dark gold. A motorised floor stand is optional. An anti-reflective, high contrast glass filter panel, developed especially for the Reference range, "contributes significantly to the TV's superior picture quality", claims Loewe. Additional features include HDMI 2.0, HDCP 2.2 and an HEVC decoder for handling 4K content. A built-in soundbar with front and rear drivers delivers "virtual 3D surround sound" without the need for additional external speakers, says Loewe. If the customer does want to add a 5.1 system, the soundbar can act as the centre speaker. The hard drive can act as a PVR, and content on it can be accessed by other Loewe TV sets in the home, a feature known as DR+ streaming. 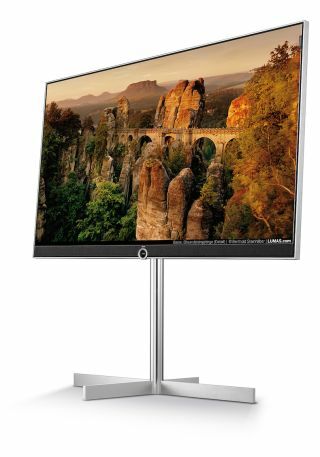 The set is initially available with a 55in screen for £3800; Loewe says it will add 85in and 75in Reference models to the line-up in August and September respectively. They join existing 4K models in the Loewe range, including the Art series (starting at £1299 for 40in) and Connect models (starting at £1999 for 40in). An all-new flagship, the Masterpiece, is expected to join them towards the end of this year.